An Inner Cookie Monster can be a ravenous beast, throwing caution to the winds and providing a justification for cookie gluttony (and fellow traveler saturated fat snacks). For children and adults who are at risk of obesity, ways must be found to tame the inner monster. Childhood obesity has risen worldwide and with it the risks of type 2 diabetes, cardiovascular disease, and other medical conditions. Realizing that strategies to treat childhood obesity are largely ineffective, the researchers at Columbia University in New York conducted research on young mice. Their hope was to find critical components of the diet that will provide a promising strategy to combat childhood obesity. The study was published in the Journal of Clinical Investigation on July 1, 2010. This study has taken a step toward understanding what may be going on with hunger and satiety. Mice that ate treats high in saturated fat (just what is used to make cookies, French Fries and other highly processed foods) had impaired sensitivity to leptin and insulin – these hormones are both involved normally in regulating hunger. It seems as though the saturated fat causes the brains of the mice to ignore signals of fullness (sent by the hormone leptin); so the mice kept eating. The mice also become less sensitive to insulin – what happens in type 2 diabetes. The effect on the mice’s brains lasted for days. So the researchers, of course, want to learn if this same mechanism works on humans. What it would mean is that if a child ate a high saturated fat meal, that child would feel like overindulging for days. Cookie Monster the famous blue Muppet from Sesame Street was born in 1969; he has always had a voracious appetite for cookies. About a year or so ago, Sesame Street tried to be a little socially responsible and designed some segments that had Cookie Monster encouraging his viewers to eat fruits and vegetables. I missed the decision and the reaction, but understand that there was a huge uproar against Sesame Street, saying that they were turning Cookie Monster into a veggie monster and they wanted Cookie Monster back the way he was. Now I think that Cookie Monster frequently says that cookies are not any time foods – they are ‘a sometimes food’. I always love Sesame Street and am so glad that they are trying to make changes that will help future generations. I hope Sesame Street will resist the lash back from individuals who may not be thinking how important it is to strengthen children from the abundant obesity-producing snacks and fatty foods in their environment. Others feel strongly, as I do. Chef Jamie Oliver gave an energetic TED talk on this subject. Did you know that the Sesame Street prop makers rarely use real cookies? That’s what it says on their site. “Chocolate, oil, and grease are all bad for a Muppet costume, so they paint rice cakes to look like cookies. But hey, that’s okay with Cookie Monster – he likes to eat healthy foods too.” I don’t believe that cookies need to be banned; but maybe consider having fruits and/or vegetables available for between meal snacks; cookies don’t need to be every day snacks. Susan Roberts Ph.D. a researcher from Tufts University says; if you satisfy your inner Cookie Monster with an apple 10 times in a row, you’ll actually start to crave the fruit – not a cookie. I’ve not done this experiment, but have had a similar experience. Looking back to my young adult life, I couldn’t really imagine giving up cookies. I remember what an important treat they were to me and how the small children loved them. But some how, cookies no longer have power over me. First, they’re not in the house, since Vic was diagnosed with diabetes. That is a long-term technique for controlling the environment – we’ll eat what is in the house. 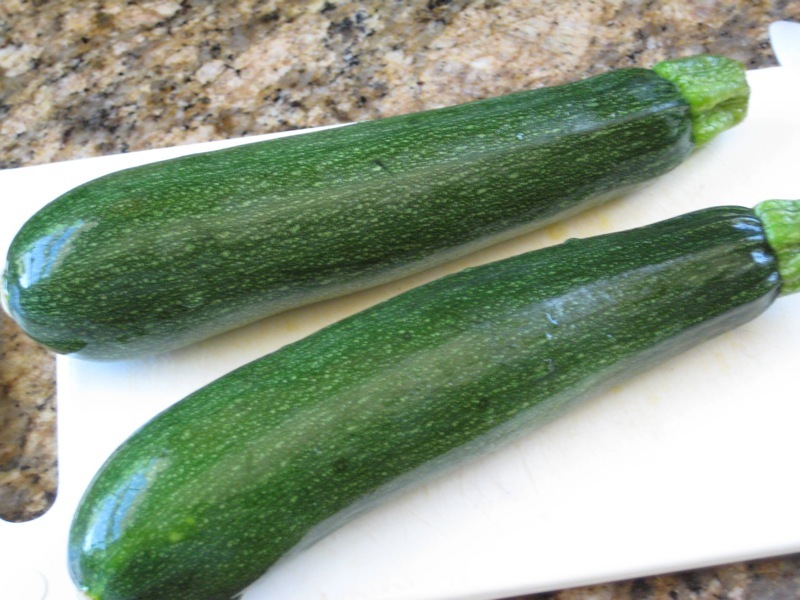 If Vic or I want a little snack to tide us over, until mealtime, we usually get a handful of nuts – a Mediterranean-style, high fiber nutritious food with protein and monounsaturated fat. I think that I just stumbled on something that is good about getting older. My usual thoughts are that getting older is not all that great (yes, it beats the alternative); but today I may have just discovered something good about it. It is that I now have a time perspective that allows me to see a longer view. Cookies were an important part of our family’s food offerings. I have a great big cookie box, that was actually meant to be a breadbox, but it was traditionally filled with cookies. Often the cookies were homemade, but sometimes they were from the store. Speaking of cookies from the store, I remember about 35 years ago, emptying a bag of cookies into the box. Some were broken, so of course, I ate them because I knew that the children would not want the broken cookies. Thank goodness for the secret dietitians’ tips not found in the textbooks, “broken cookies have no calories – the act of breakage causes caloric leakage.” Saying this and laughing a little always helped then. Perhaps this small ruse partakes a little of the reaction of the cookie-monster fans who didn’t want this icon of happy cookie consumption to break the spell and tell the truth about keeping cookie consumption within strict bounds and introducing hated veggies. Back to my reminiscing – I remember frequently dieting to maintain a healthy weight. I would struggle and often be hungry, but I’d make my goal. And as some of you have experienced, it seemed like no time at all before my weight was back to the place where I needed to ‘diet’ or ‘starve’ again, whichever way you want to look at it. Could eating more fruits, vegetables, whole grains, and less processed foods be the key to the end of dieting again and again? I think it holds real promise. If I eat our regular high fiber fruits, vegetables and whole grain meals, I’m not scouting around for extra food. I’m glad that the researchers are getting to the bottom why the fruits, vegetables and whole grains work. “C” may be for cookies, but it’s also for cabbage, cauliflower, cucumbers, carrots, celery, corn, chilies, chick peas, chard, cereal, cantaloupe, cranberries, Clementines, cherries, currants, citrus, crab apples, and cumquats. I want to share one last thought on this issue. It is interesting to me that having had few cookies for several years now (about 6), something has changed in my thinking about them. Cookies have somehow become tamed, in my very own mind. Once I had my own ravenous Cookie Monster within me, encouraging me to give in to the seductive power of cookies and devour them passionately. It took a while, but my inner Cookie Monster has been tamed. She still likes a cookie now and then, (especially with chocolate chips), but she is more than happy to invite a cookie in but rarely, and then perhaps only part of it. My inner Cookie Monster has grown up and become wiser, stronger, and healthier. I’d have to say that I’m really glad about that. One other observation as related to cookies or other high saturated fat sweet treats, is that if I’ve passed my normal meal time, I can ravenously over-eat just about anything. If cookies are all that is available, my inner cookie monster, strengthened greatly by the hunger hormone (ghrelin) coursing through my blood, will lead me to pounce on and overeat any cookies that may be at hand. So planning ahead, and having healthy choices available is key for me, even with my now more domesticated cookie monster. I’m sure that some of you will find that these precautions will help you and your family as well. This is a big recipe that I made to take to a neighborhood picnic. I thought that there would be a little left over; but every last wheat berry was eaten. There were lots of compliments. 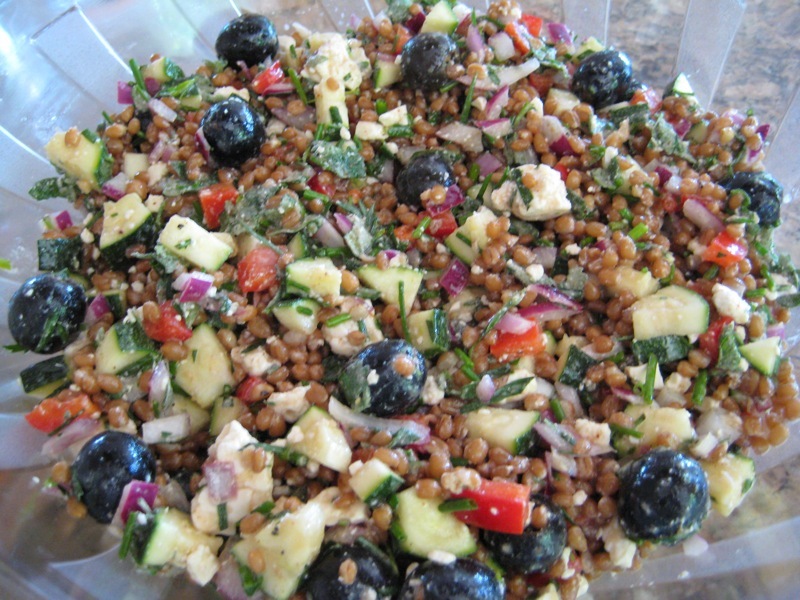 Perfect for the 4th of July gathering - whole grains, herbs and vegetables - Mediterranean-style and delicious. 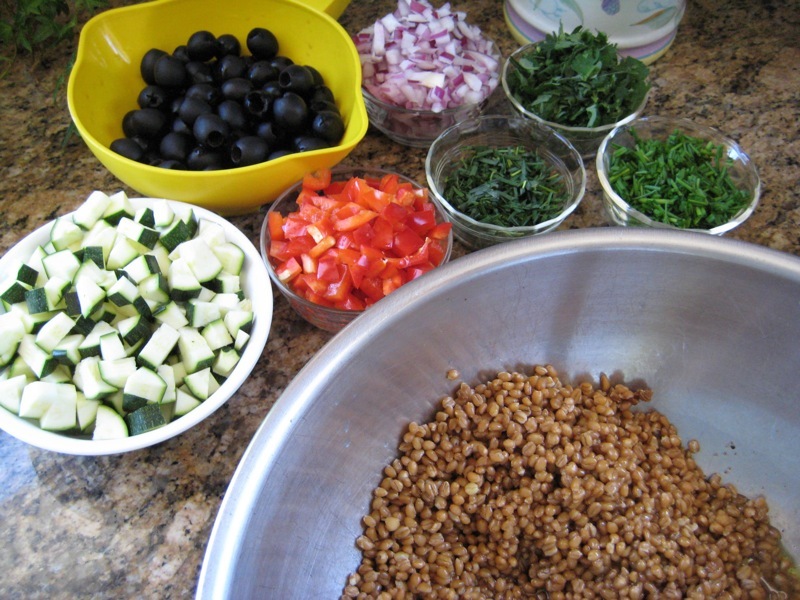 If you have cooked frozen wheat berries, remove 4 cups from the freezer. Defrost in the microwave for a minute or two. If you don’t have cooked wheat berries, cook 2 ½ cups raw whet berries in 6 cups water for about an hour to 1 ¼ hour, until desired tenderness. Combine all vinaigrette ingredients; stir together. 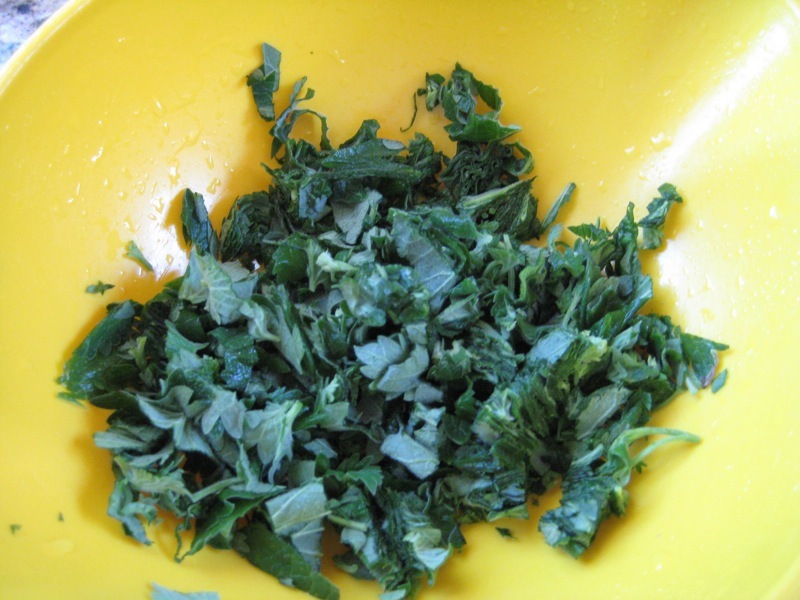 Stir in the salad ingredients and refrigerate until ready to serve. 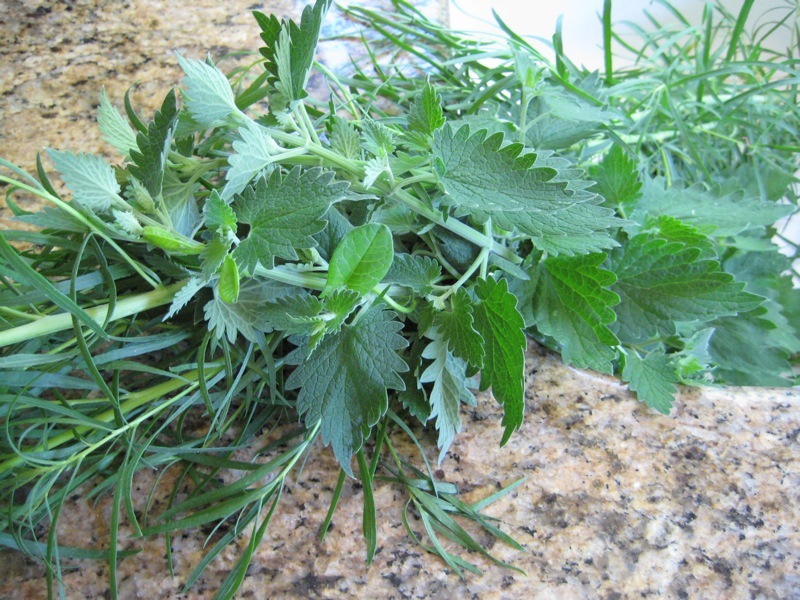 Herbs from the garden - that's fresh. 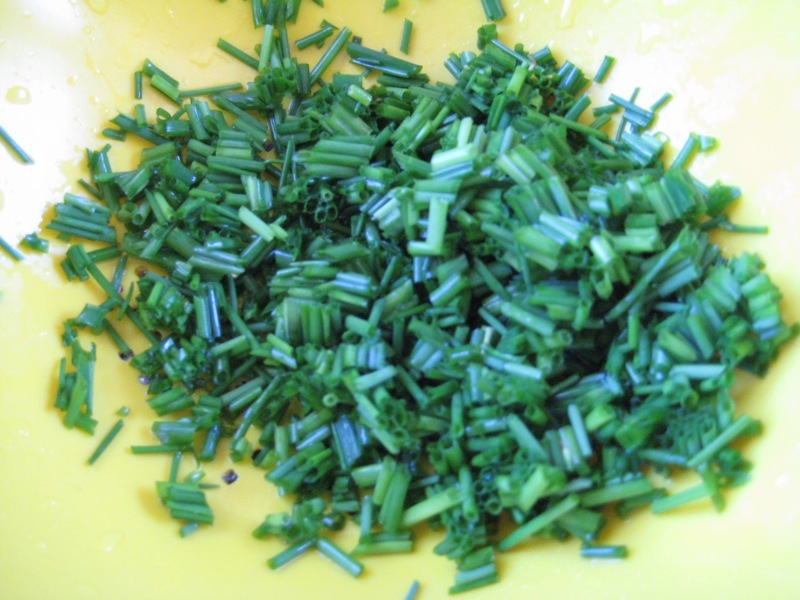 Rinse the tarragon and remove the heavy stems. 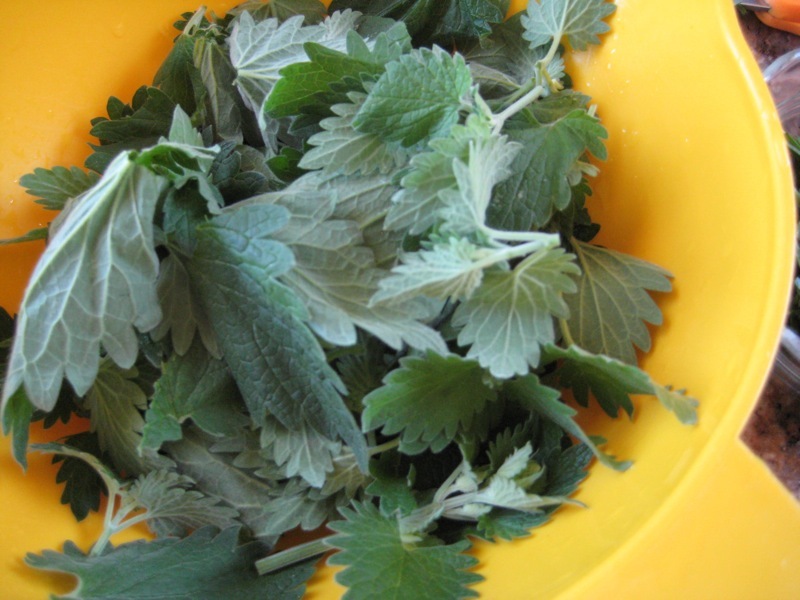 Roll the mint leaves up and cut with scissors. 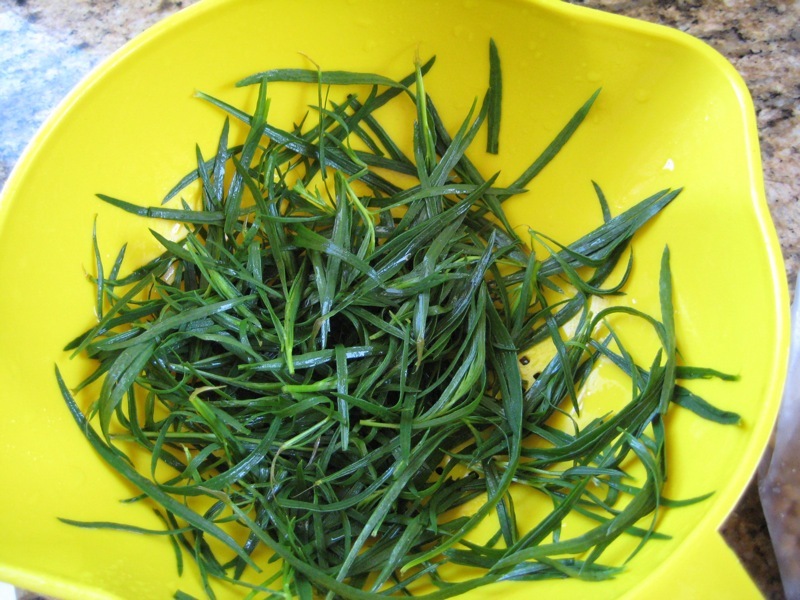 Rinse the chives and chop into small pieces with scissors or knife. 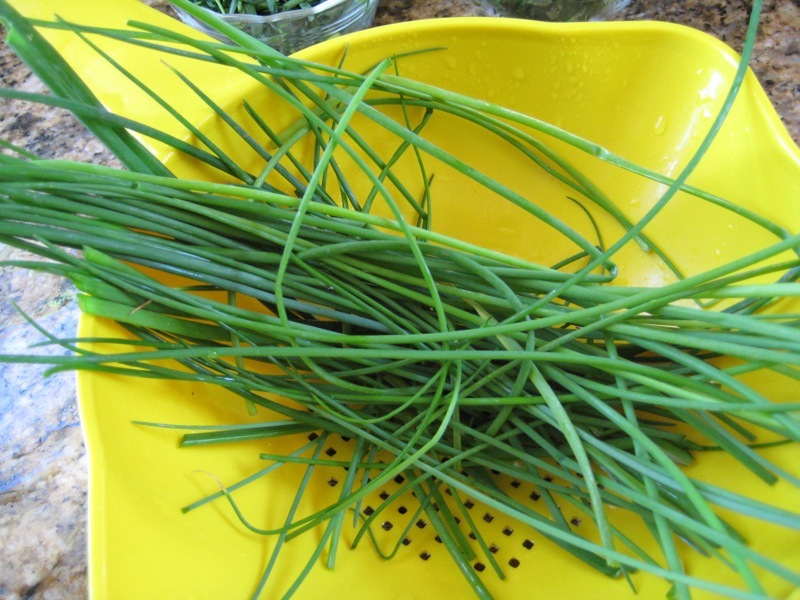 These chives were cut with scissors. 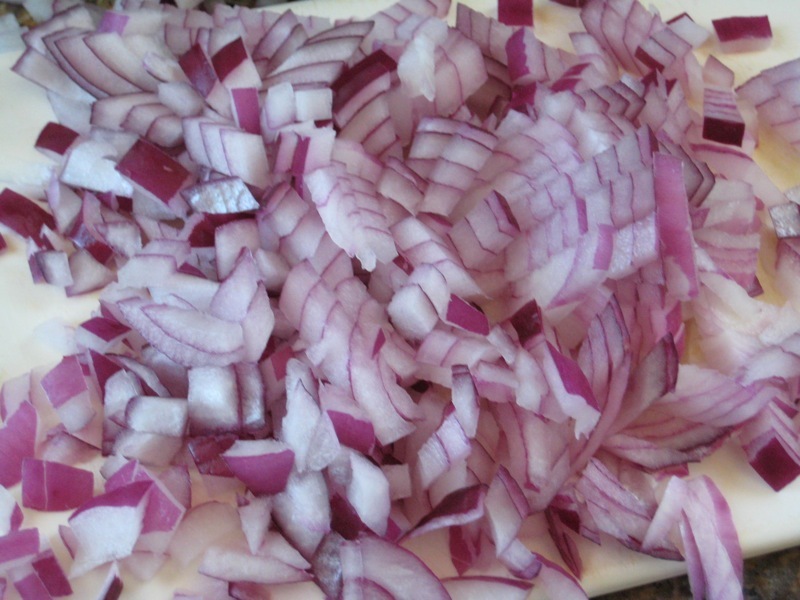 Chop the red onions fairly small, or as desired. Chill and serve to a large group.